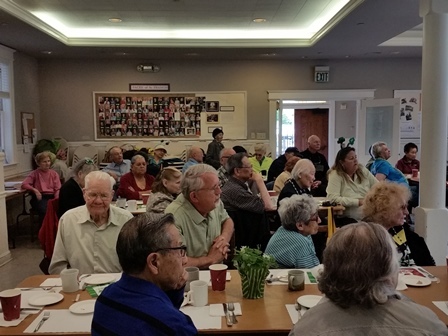 All seniors are welcome at the St. Francis Senior Center. Location: We are near Market, accessible from MUNI Metro, 37 Corbett & 22 Fillmore lines. Entrance at the north side of the church and is wheel chair accessible. PLEASE PUSH THE PARISH HALL BUTTON AT PANEL. The weekly senior program is WEDNESDAYS ONLY. Join your friends to see “Nile.” Travel the Nile (the world’s longest river) with Joanne Lumley as your guide. Wed., Apr 17 Mary Spalding performs on the Caribbean steel drums. Mary has studied and performed on steel drums for the past 25 years, and is delighted to have the opportunity to demonstrate the beauty and versatility of these instruments. Don’t miss the performance! Wed. Apr 24 Conservatory of Music students will perform. Enjoy the music of a Melody Stein on the harp and Chia Fu (Kathy) Weng on the violin. The St. Francis Senior Center is sustained by the generosity of those who give of their money, time and caring hearts. We are grateful for all who contribute in making this place special! The cost of our program is $2.00. If you can put in more from time to time, we ask you to do so. We appreciate your support. We thank you.